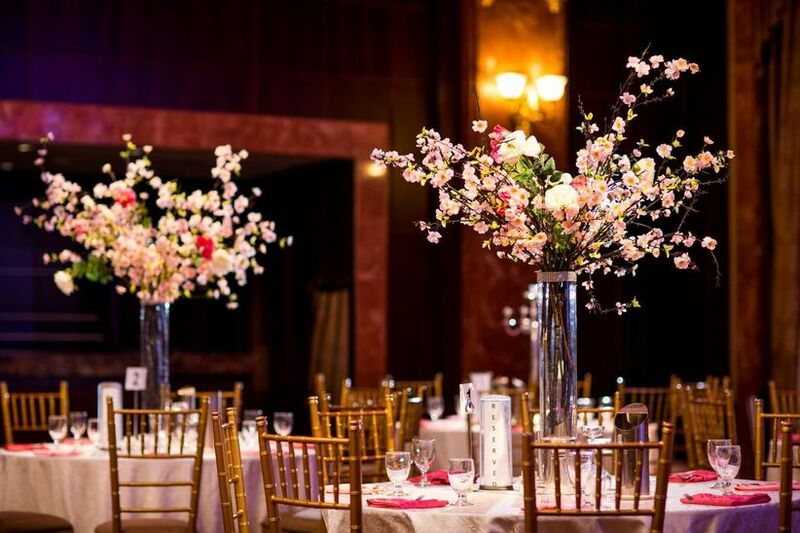 Wedding Centerpieces 101 | Wedding Ideas ARE YOU A VENDOR? 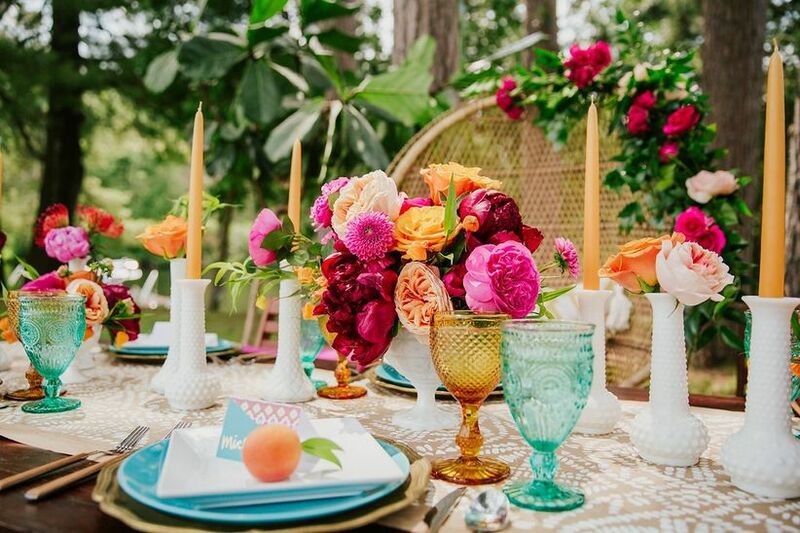 Need a master class on centerpieces? We’ve narrowed down everything you need to know about arrangements to help you out. Wedding centerpieces are essential decorations that help jazz up any reception hall. While the process is a fun one, choosing your arrangements is much more involved than just listing off your favourite flowers. From colour schemes to vessel decorations, there are a lot things to remember before you start ordering. 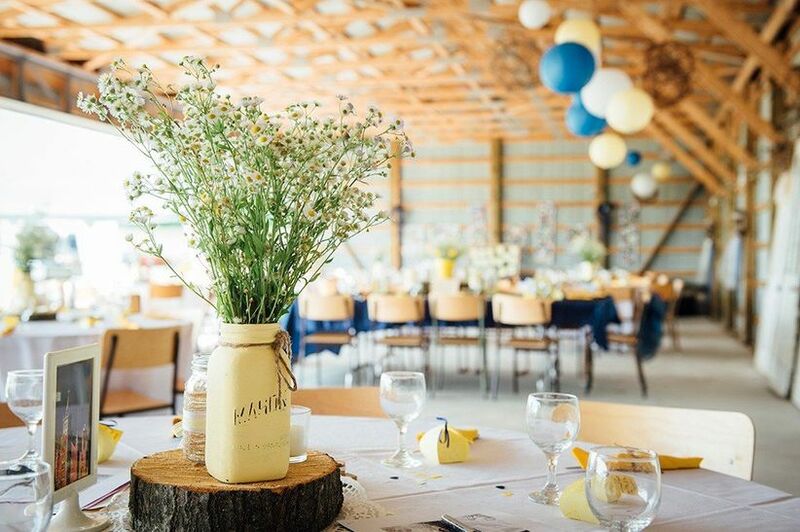 Here are the ins and outs of ordering your wedding centerpieces. 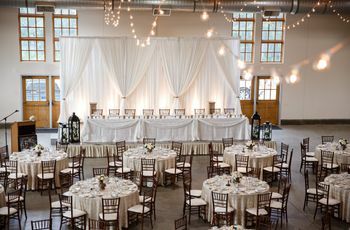 The total number of arrangements you order should match the number of tables in your reception venue. Don’t forget to order flowers for buffet tables, the head table and the welcome table (they may look a little bare without them). 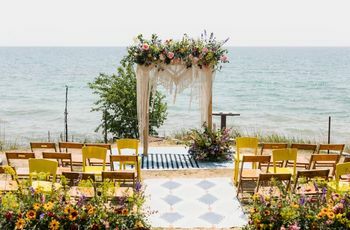 As with all elements of your wedding, you’ll need to set a budget and stay inside it (typically, 8% of the overall budget goes toward flowers). Centerpieces can get pretty costly, especially if you’re adding rare blooms. Going for larger arrangements? You my want to stick to lower-priced flowers. Opting for pint-sized arrangements? You may be able to splurge on a few costlier plants. Make sure your florist is aware of your budget right out of the gate so that they don’t accidentally sell you on pricier flowers. Tip: you can always repurpose the flora and fauna from your ceremony to save a bit of extra cash. 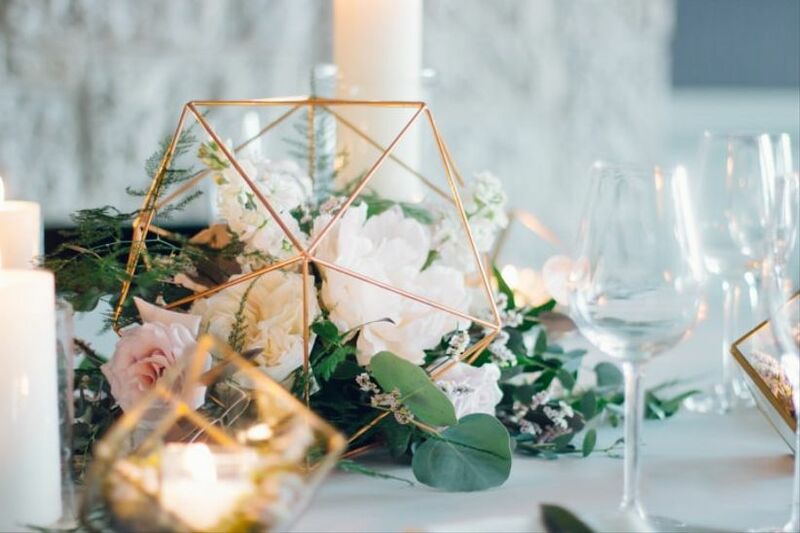 Think about everything from place cards to table linens to the venue itself when selecting the colours for your arrangements. Bring samples and photos of these to your florist to see if he or she has any suggestions. Typically couples go for bright and bold colours in the summer and jewel tones in the winter. Feel free to break the rules and get creative, it’s your wedding, after all. In Canada, we’re lucky enough to experience winter, spring, summer and fall. But just as seasons change, so do the flowers. Ask your florist what will be available around the time of your wedding and work with that. 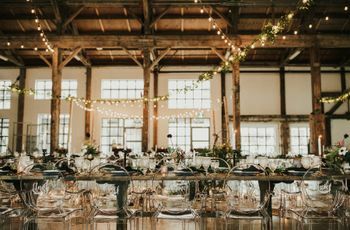 If you’re getting hitched around the holidays you may have to kiss your dreams of a sunflower filled reception hall goodbye, but you may have some more festive options like evergreen branches and poinsettia at your disposal. A few types - like lilies, roses and hydrangeas - are available year-round, making them good for any season. 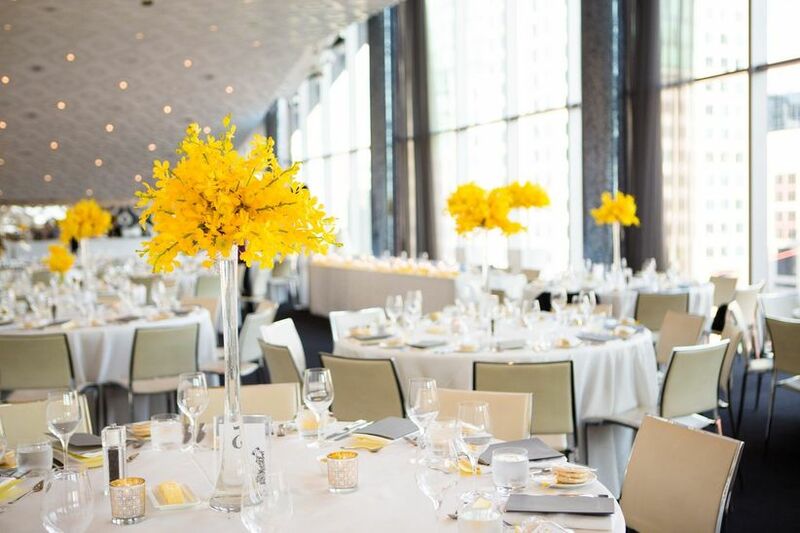 Consider the overall vibe of your reception before ordering your centerpieces. While you may love how swanky orchids look, they may not be the best choice for a low-key barn party. 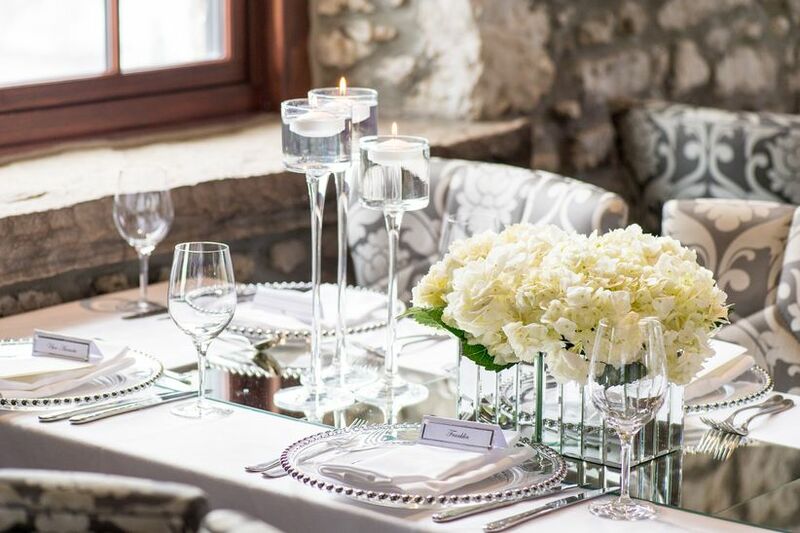 On the flip side, you may have a thing for wildflowers, but they may not fit the bill for an upscale hotel soiree. 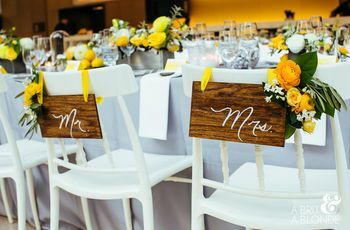 You’ll want to think about the colour scheme, venue and overall feel of your reception before you start crafting bouquets to avoid having things look out of place. Before you select a vessel, you’ll want to figure out the height of your arrangements. 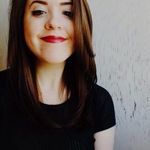 Do you want something sky high and dramatic or short and sweet? 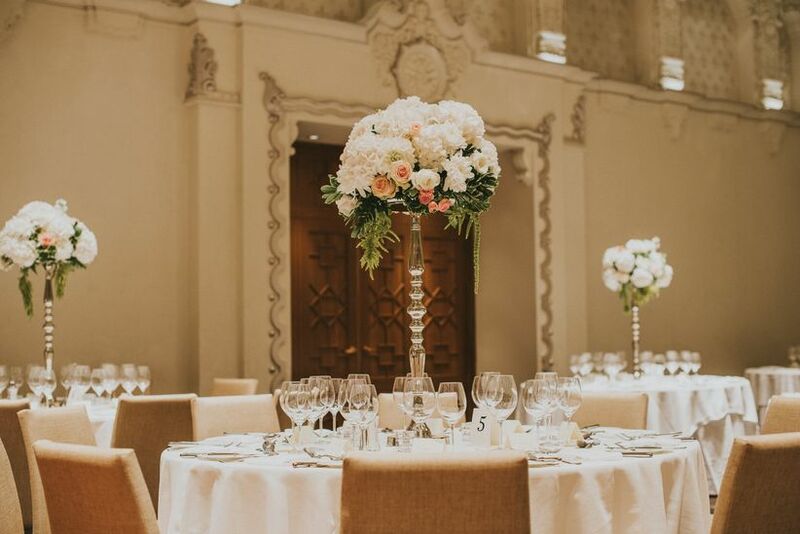 Taller arrangements have a regal, luxurious feel, perfect for big, black tie receptions, however, make sure they are tall enough as to not block your guests’ view. Shorter arrangements benefit smaller tables but may need a few extra flowers and accents to make them eye catching. If you can’t decide on a style, you can always do a mixture of short and tall. 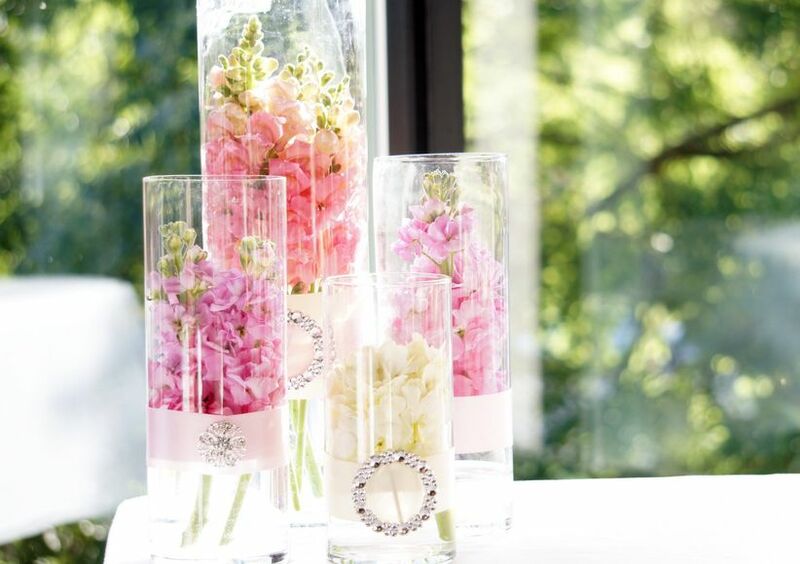 Give your centerpieces that extra oomph by adding a few decorative touches. 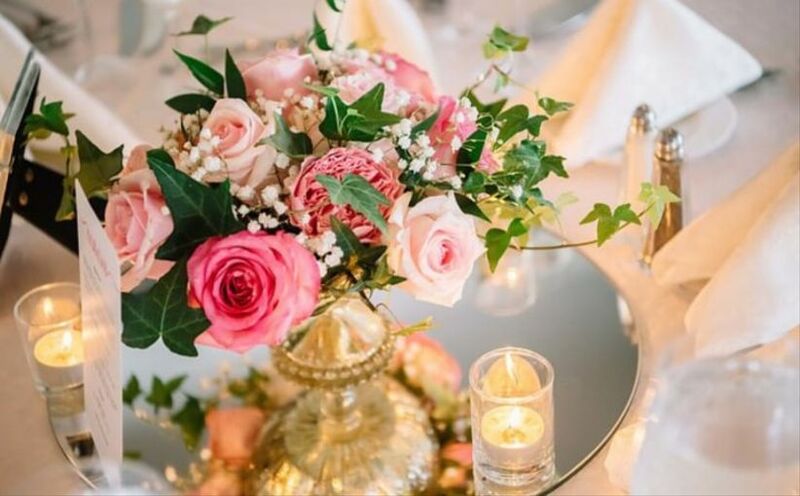 While you’ll want the flora and fauna to be the star of the show, throwing in accents like pearls, gems and feathers will give your arrangements a special touch. If you’re looking to add some height, go with a few tall branches or feathers. If you want to keep your centerpieces a little shorter maybe drape a few strings of pearls around your vases or stud them with jewels. Options are endless!